Staff from house builder Bovis Homes have come together in support of a local charity, raising more than £285 to boost MK Food Bank's vital community work. With the money raised, the company was able to provide a variety of essential food items to donate to the bank, including tinned vegetables, dried pasta, tea and coffee. Members of the team then paid a visit to the charity's warehouse to deliver the goods (pictured). Bovis Homes set up its regional headquarters at offices at the Pinnacle building in the centre of Milton Keynes back in November, and this is the second time staff have raised money for the food bank, having donned an array of Christmas jumpers to raise more than £100 back in December. 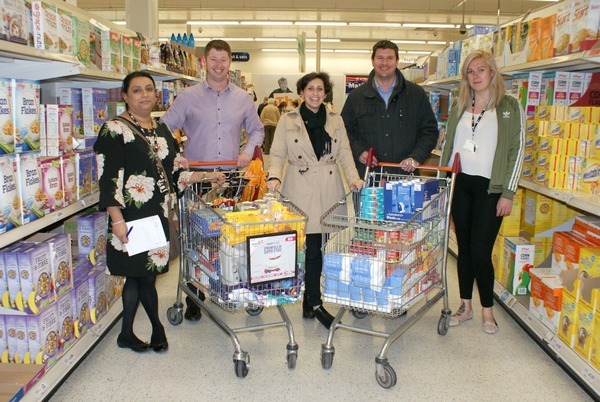 The fundraising efforts were organised by Bovis Homes marketing manager Allison Cardoso and Technical PA Manjit Chaggar. Allison said: "We're delighted to be able to support a great charity like MK Food Bank again. When we moved our regional office to Milton Keynes late last year, we quickly felt part of this great community, and so we're very pleased to be able to give back to such a deserving local cause where we can." Milton Keynes Food Bank provides emergency, short- term food supplies to individuals and families within the town who hit a crisis situation for whatever reason. It relies entirely on donations of food and money from local schools, churches, individuals and businesses like Bovis Homes.